For many homeowners, the most challenging part of any bathroom remodel is not experiencing the process itself, but it is finding an experienced, trusted, and reliable contractor to start and complete the job. Detail and define. Before you start talking to bathroom remodeling contractors, browse through home remodeling magazines and online galleries, check out showrooms and retail stores, and carefully conduct online research for styles and materials that peak your interest. By providing to prospective bathroom remodeling contractors a ballpark idea of what you want your new space to look like, he or she can better estimate the time and cost involved in helping you reach your goal. Talk around town. Chat with neighbors, friends, or family about their bathroom remodeling contractors. You can also read online customer reviews. Check references. When you talk to potential bathroom contractors, ask for the names of recent customers. Follow up with these leads, and talk to them to learn more about their projects. Ask them if the contractor met their expectations? Also, inquire about any delays or miscommunications. Finally, ask how the company handled any unexpected hiccups, or if they would hire the contractor again. Get it in writing. 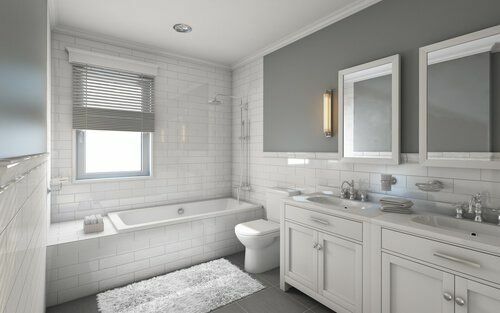 We recommend always getting a written estimate from a licensed bathroom remodeling contractor that clearly defines in great detail the scope of work for your project. Confirm it is legitimate. Make sure you can reach the bathroom remodeling company when you need them. We urge customers to always be cautious of businesses that list only a P.O. box address, but no street address. Never hire unsolicited, door-to-door workers, or those who cannot provide legitimate qualifications. Check their license. Believe it or not, some states or localities have no licensing requirements for remodeling contractors, which can make it challenging for homeowners to look into a prospective contractor’s background. Never rely solely on the bathroom remodeling contractor’s word to know whether his or her license is valid. Verify it through appropriate agencies. Most importantly, be aware that bathroom renovation services often require electrical and plumbing work, so make sure you hire a qualified, valid professional. Verify insurance and bonding. Always ask a contracting company for proof of insurance or bonding. A legitimate bathroom remodeling company should be happy to share this information. Set a budget. Be aware that particularly in bathroom remodeling, contractors might find hidden problems, often related to water or mold issues. Incorporating a contingency within your budget can help minimize the strain of these kinds of issues. Read the fine print. Never assume a bathroom remodeling company’s contract will cover all of your needs. Carefully read the details of the proposed contract, and understand how any change orders will be handled, should they arise. Check-off punch list items. Before you make a final payment to a contractor, create a punch list and make sure they have completed the work to your satisfaction. Finally, when hiring bathroom remodelers, it is important to plan for flexibility during the project. This area is one of the most overlooked, but essential considerations. For instance, how will your bathroom remodel change your family’s daily routine? Where will you store the materials? What will the crew members’ working hours be each day? Are you struggling with the decision of which bathroom remodeling company to hire for your bathroom remodel? If you conduct research before hiring your bathroom contractor, it will be well worth the effort. You will also have the peace of mind that comes from knowing you have hired bathroom remodelers who you can rely on for future remodeling work. Contact us today to schedule your complimentary consultation, or download our latest bathroom guide, “Stunning Bathroom Remodeling: From Concept to Completion” to learn more today!